While we were clearing out my father’s condo, I made a point of carefully wrapping everything I remembered he had since I was a child. I’m sentimental and so was my father. 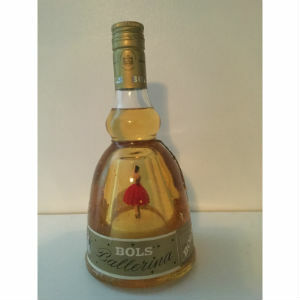 In addition to a lovely array of liquor, he had an unopened bottle of Bols Ballerina. He had that in his bar on Long Island and took it with him to Florida. It’s one of those things that looks out of date and should be thrown away unless it has a special meaning. My husband is putting the finishing touches on his bar/man cave and I brought down some of my father’s items. I told him how long my father had the Bols Ballerina. “What? That’s at least fifty years old then.” The reality of a half a century unnerved me a little. That is indeed a long time. I have memories that span half a century. While my husband was carefully arranging his bar, I told him the ballerina used to dance because it’s a music box too. Bols is imported from France and the song is labeled on the bottom “Le Bleu Danube.” Oh, the French. It’s Strauss’ “The Blue Danube.” I started reminiscing and not paying attention to my husband tinker with the bottle. My father would wind up the music box, set it on his bar, and I would watch the ballerina spin gently as swirls of gold flecks descended to the bottom. I could feel myself smiling as a child watching the tiny ballerina. When it would stop, I would just smile at my father and he would wind it up again. I wandered into our alcove thinking about those times. I played “Tiny Dancer” by Elton John on my ITunes app. In my teen years, I would play the vinyl record by Elton John and wind up the ballerina while I was dusting. I would listen to both songs, watch that tiny dancer, and think back on my very young years. I was sentimental even back then. My husband came out of his shop, held the bottle in front of me, grinned, and said, “Listen.” He fixed the music box. I just stared and cried. “Well don’t cry,” my husband said. “You don’t know how much this means to me,” I sobbed. “Yes, I do,” my husband said. He did. He really does know what my father means to me. My husband is not as openly passionate as I am but he understands me. “Please play it again,” I cried. My husband and my father played the music box ballerina for me a few times. Decades of memories collided into one. I wanted to wrap myself around this effigy of my father and hear, “Hold me closer, tiny dancer,” while the Blue Danube Waltz played again on the music box. It was a surreal moment. It’s not the little things that matter but the little things we do that matter. My father winding up a music box, my husband fixing the same music box, and me listening to the music box. My father may be gone but he’s not forgotten. His life was not in vain. I can keep his story going. I don’t have much as far as talent goes but I have words. I’ll just keep using those words to tell his story. For the next couple of weeks, I’m sure I’ll have Elton John’s song, “Tiny Dancer” stuck in my head. Since my husband’s tinkering with the music box, I can alternate between that song and The Blue Danube. It’s a rather interesting combination when both songs are playing in my head. My healing journey continues. Join me. We can listen to waltz and Elton John and watch the tiny dancer dance…because it’s the little things we do that matter.